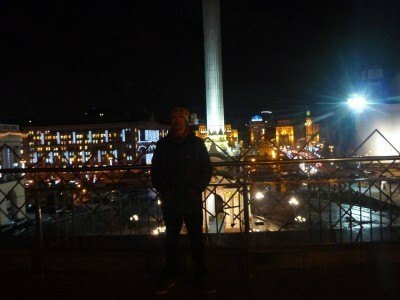 While backpacking in Ukraine I was able to go on a free night tour of Kiev, the country’s capital city. I was staying bang in the centre of the city at Tiu Kreschatik Hostel. I heard about a free tour starting daily at 12 noon outside the earth monument in Liberation Square (Maidan Square) so I headed there. 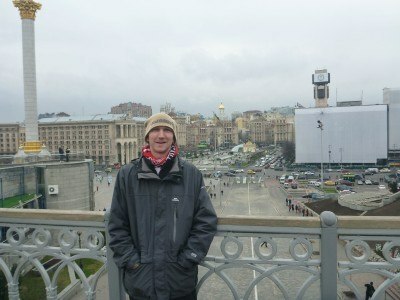 However the tour wasn’t on that day at noon so I toured the main sights of the city on my own by day. 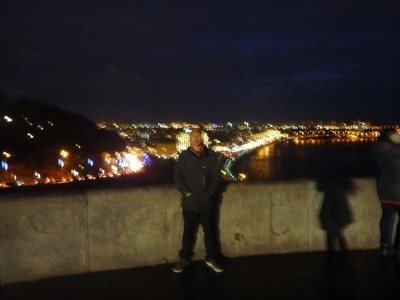 Then at 4 pm I heard about a second tour, a night tour of the city. 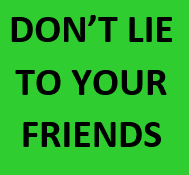 It was organised by the same company and is also free. 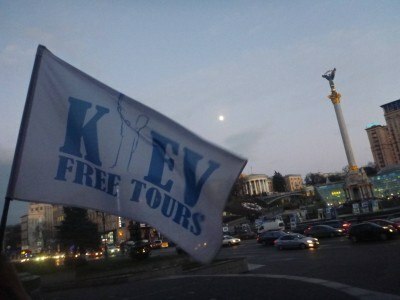 The company’s website is http://freetours.kiev.ua/ – Kiev Free Tours. I met my guide Lyza, a local lady at 4pm and off we went. For the first 10 minutes of the tour it was in daylight. The rest was done in darkness. It gets dark quickly in the winter. Here are my personal top 8 sights on the tour. 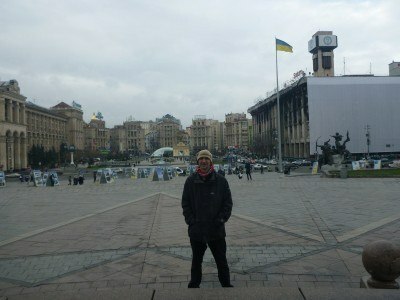 The tour starts in the magnificent looking Maidan Square. 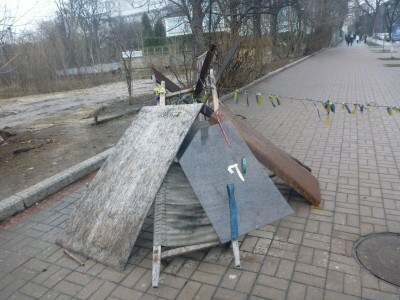 Here we see a Ukraine flag hoisted high. The square is a top quality photographers and backpackers gem by day, at night less so as the fading daylight takes over. But it’s the history within. Lyza takes me through some Ukrainian history, most of which is new to me. 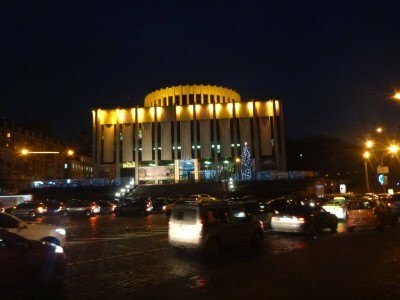 Being an ex-Soviet Union state, we know that the theatre and drama will play a part in the city’s culture. The Philharmonic Opera Theatre sits at the bottom of Kreschatik Street at Yevropeiska Square. There’s also a large hotel here and a very busy roundabout. 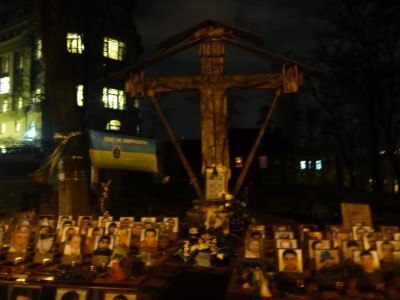 Ukraine’s capital still contains references and standing memorials to the Soviet times. The irony for me is that the Soviet Arch down by the river front is actually here to represent unity between Ukraine and Russia. It was constructed between 1978 and 1982 and remains to this day. 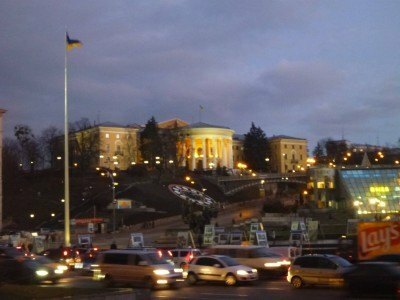 Despite the recent troubles between Russia and Ukraine, the locals have no issue with the arch’s existence and life in busy Kiev carries on regardless. 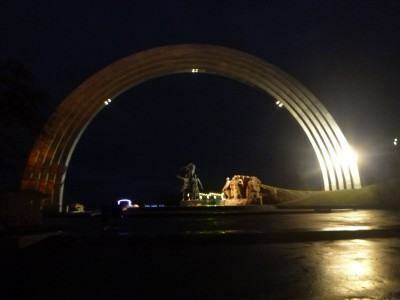 I toured the arch in the day time too, so you can see what it looks like. 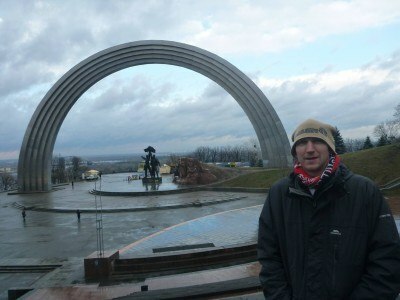 There’s a throwback to Soviet era for sure with the monument under the arch. 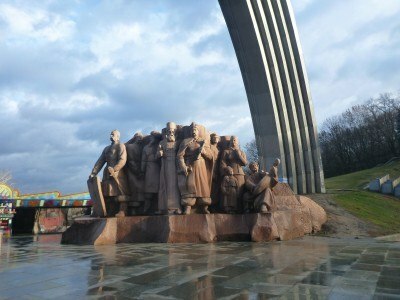 Soviet style monument under the arch. 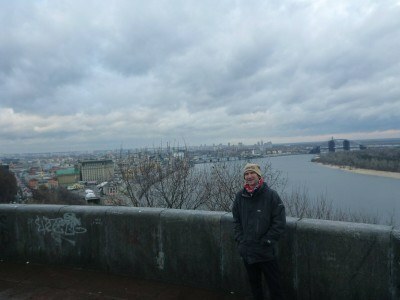 So just behind the arch you get a cracking viewpoint over Kiev and the Dnipro River. The river is damn wide and believe it or not, during my time in Kiev, I never once went to the other side of the river, except when going to the airport and getting a flight to Almaty, Kazakhstan. Again, I was here in the day time so I’ve included that photo below so you get an idea of the view. 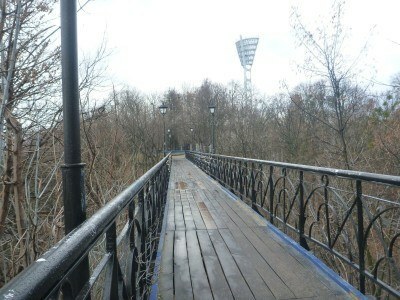 We continue our walk through Kreschatyi Park and we veer up some steps past A Water Museum. There is a statue of famous lovers here and behind it a bridge which has lovers locks on it. Lyza describes it as the Kissing Bridge and also of note there is a road running underneath the bridge and the bridge itself is wobbly and seems a bit dodgy. Lyza also tells me that on one of her tours, a woman refused to walk across the bridge and left the tour early because of it! 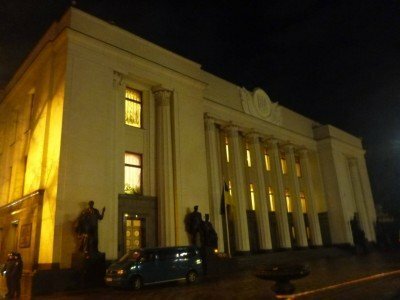 The Ukrainian Parliament is a less than impressive and rather subdued building. In fact, I first walked past it in the daytime and didn’t even know it was the actual parliament. Lyza explains the crest symbol that we see on the Ukraine Coat of arms, which features at the top of the parliament. 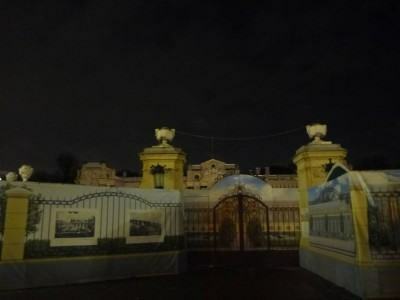 In blue and yellow, it’s the Sign of Princely State of Volodymyr the Great and if you look closely you can spot some Ukrainian letters within it, cleverly weaved into a symbol. 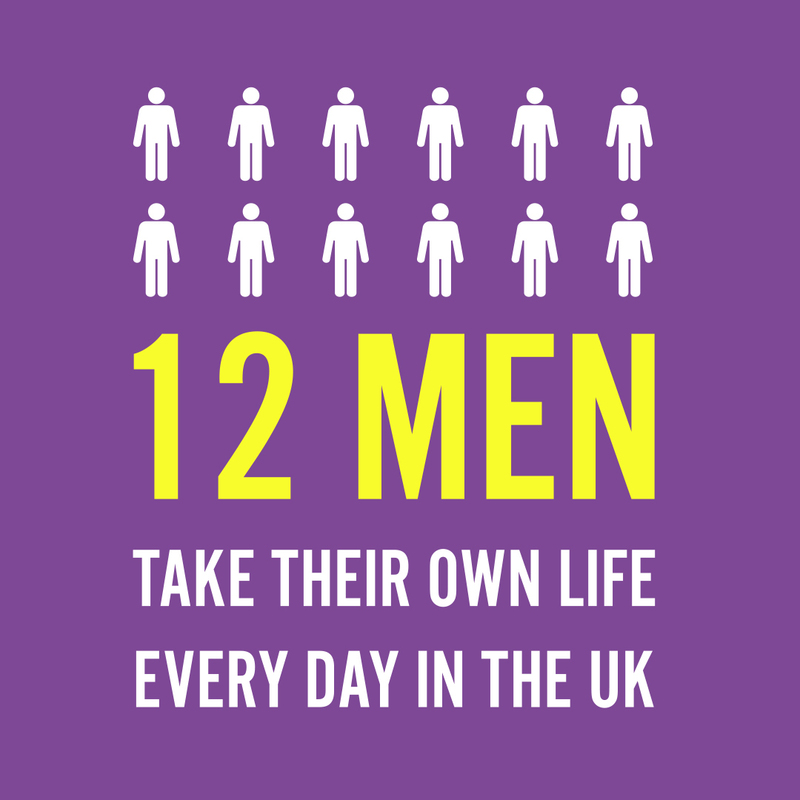 There are various rumours as to what the design actually is with different people having various opinions on it. Some believe it to be an eagle. 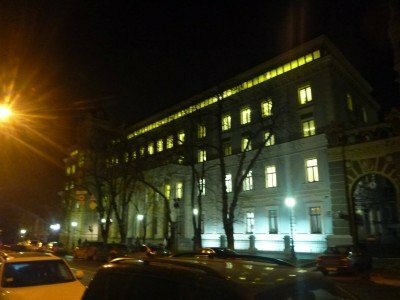 Beside the parliament there is also Mariinski Palace, which was being renovated during my visit. I didn’t go inside either building – at the time they were closed for tourists. 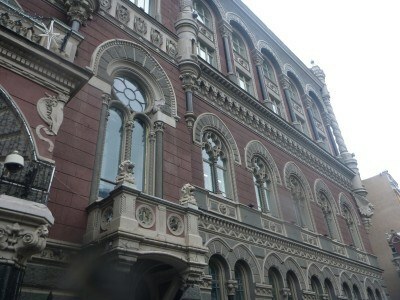 On the same street, Hrushevsky Street houses the National Bank of Ukraine. This is an architecturally rich building which strikes out at you. On the corner of it there is a tower, which somehow doubles as a Lookout Tower. 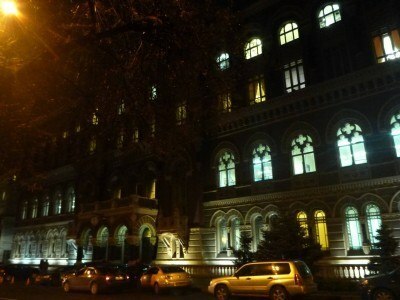 Nighttime outside the National Bank of the Ukraine, tower at the end. 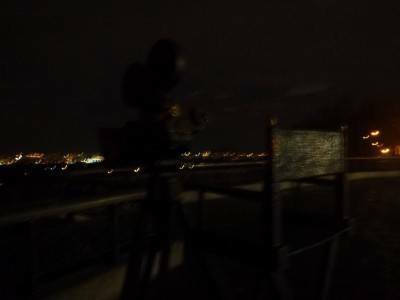 It was from this tower, they reckon in 2014 that unknown people with snipers shot at the innocent crowd on the avenue, killing many Ukrainian demonstrators. 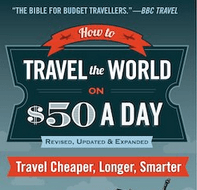 It’s a pretty fresh and odd time to go backpacking in Ukraine as the history of relevance is recent. 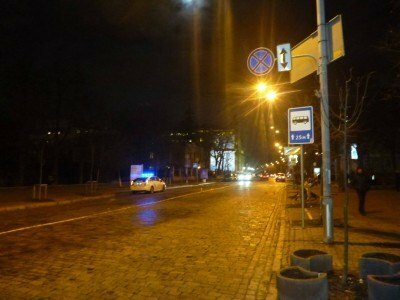 Here on this rather odd street, is where snipers killed protestors during the recent revolution, yes the Ukraine Revolution and ousting of President Viktor Yanukovych happened in February 2014, less than two years ago. 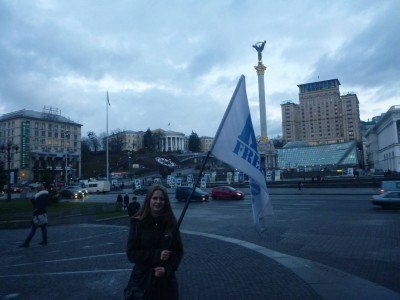 The streets leads down from this bank to Maidan Square and the Hotel Kiev (one of Stalin’s buildings). These days, there are some memorials to those who died, there were 108 deaths over a few days of the revolution, most of them occurring on this street. After walking back down Instytutska Street, we arrive back at the Cultural Centre and Maidan Square, where the tour began. It was a full circle 2.5 hour tour that covered a lot and I just touched the surface here, Lyza spoke at length about a load of more cool Ukrainian history and culture. As you can tell, I did the same walk in the daytime to ensure I could get some better photos. 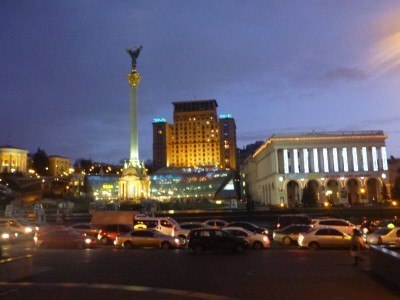 Kiev is quite dark and dreary at night in fact, but turns into a colourful metropolis in daylight hours. 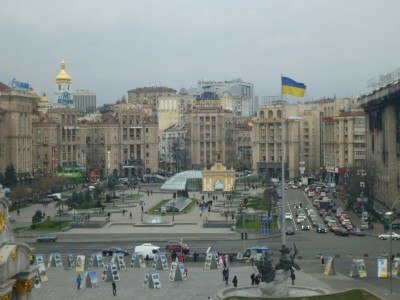 I’ll try and cover some more stuff on daytime Kiev at some point. 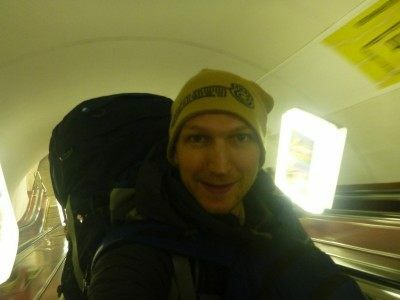 Backpacking through the Kiev Metro, in the world’s deepest tube station! Thanks to Lyza for the tour. It was awesome. 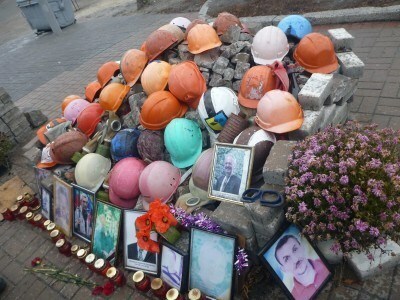 I will type up more Ukraine stories and sights including Kiev and Lviv in the daytime, but I’m still trying to get through my mega interesting Chernobyl tour posts, yeah like backpacking in Kopachi, Pripyat and Chernobyl Town. 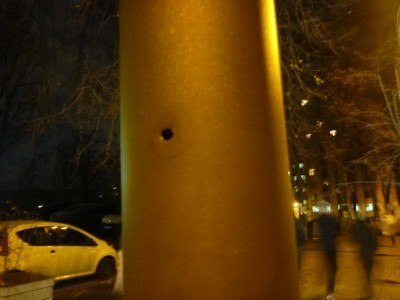 This entry was posted in Central Asia/Middle East, Europe, kiev, Kiev, Ukraine, Ukraine. Bookmark the permalink. Did your tour guide discuss how much tourism has been affected since the Ukrainian Revolution? From what I gather, the country is very much safe to travel within and “back to normal” with the exception of the conflict along the Eastern border with Russia. Or am I completely mistaken by that thought?